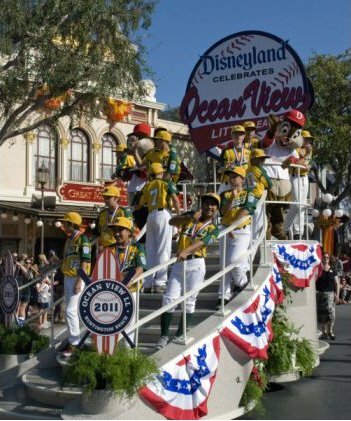 Disneyland honored the Ocean View Little League team, winners of the 2011 Little League World Series, at the park on Saturday, Sept. 17. The team was on a float that went down Main Street U.S.A. at the park, then had a team photo taken with Mickey Mouse in front of Sleeping Beauty Castle. 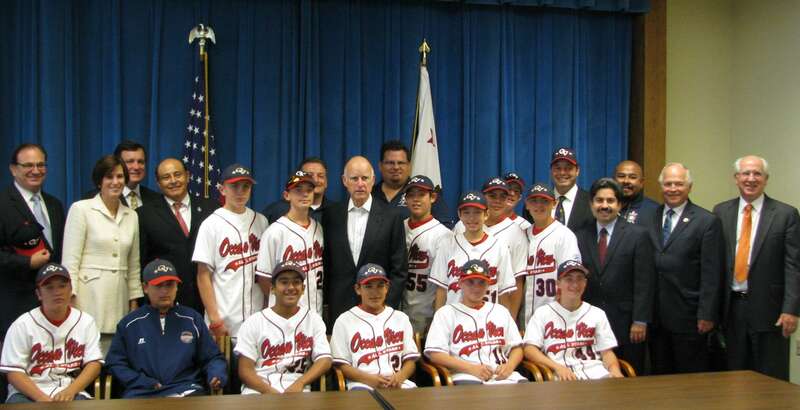 Saturday, September 10, 2011, the City of Huntington Beach honored the Little League World Series Champion OVLL All Stars with a Parade down Main Street starting at 3:00 PM, followed by a presentation on the Huntington Beach Pier. Prior to the Parade, from 11:00 AM - 3:00 PM a generous and classy group of sponsors hosted a BBQ fundraiser in the parking lot of The Huntington Beach Art Center, with proceeds benefitting the Ocean View Little League World Series Travel Fund and OVLL. Past teams played on: Farm Twins, Minor B Astros, Minor A Sidewinders, Minor A Red Wings, Major Padres and Winterball teams - Wasabi Warriors and Blues Brothers (and a Sister). Goals and Aspirations: To play for UCLA or the Washington Huskies in College. Fondest memory at OVLL: Definitely the pick-up games between the Minor A and Majors field. And almost hitting my mom with a homerun! Message to OVLL: Play hard! Try your best! And have a good attitude. Try not to imitate anyone, be yourself! What I will miss about OVLL: I will miss playing baseball with my friends. Fondest memory at OVLL: My Home Runs and making the All Star team. Message to OVLL: Never give up, follow your dreams, and live in the moment at OVLL. It will be the best time of your life (I think..I'm only 12). Other sports you play: Football, Wakeboarding, Snowboarding, and Motorcycle riding. Goals and Aspirations: For this season I would like to go toTOC again and make All-Stars. What I will miss about OVLL: Play baseball with my friends and the snack bar. Fondest memory at OVLL: Hitting my first Grand Slam back in Minor B, winning the league, and going to TOC with the Sidewinders. and play 11 year old All-Stars last year. Message to OVLL: My nine years at OVLL went by pretty fast. Enjoy your time with OVLL! Fondest memory at OVLL: TOC!! When I was on the Bats and Cubs my team went to the championship game!!! Message to OVLL: I've had a lot of fun at this league and I want you to have fun here. And always never give up. Believe in yourself and think of your next pitch!! OVLL Rocks! Goals and Aspirations: I would like to play high school sports. What I will miss about OVLL: Just being there. Fondest memory at OVLL: It was an honor to represent OVLL on the All-Star team and in the TOC with the Cubs. Message to OVLL: Thank you to everyone that volunteered their time to make OVLL great. I especially want to thank my managers: Tod Carter, Dan Chambers, Eric Smith, Jeff Pratto, Eric Willis, Tony Cianca, Tod Minato, and Steven Blokdyk. Goals and Aspirations: Become a professional baseball player and play for the Angels. What I will miss about OVLL: Playing pick up games. Message to OVLL: Practice as hard as you play! What I will miss about OVLL: is the 200 foot fence. Fondest memory at OVLL: was the game when I pitched a shutout and hit two runs in the same game. Message to OVLL: Whether you think you can or you think you can't you are right. BELIEVE!! Past teams played on: T-ball Cardinals, Farm Rockies, Minor C Royals, Minor B Orioles, Minor A River Cats, Majors Dodgers (twice), Majors Nationals + 3 Winterball Teams. Favorite Coach: Dad and Mike Vercoe High School likely to attend: HB or Mater Dei or ?? Goals and Aspirations: Play high school and college baseball and get drafted by a warm weather team. What I will miss about OVLL: Playing with my friends and hanging out at the field. All Stars!! Fondest memory at OVLL: Playing in San Bernardino in front of 14,000 friends and fans and a national ESPN audience - TWICE!! Message to OVLL: Always play hard from the first pitch to the last out. Goals and Aspirations: Play Major League Baseball. What I will miss about OVLL: The food and hanging out with friends. Fondest memory at OVLL: Hitting my first homerun in Minor B. Message to OVLL: Play hard, never give up, and be a good sport. What I will miss about OVLL: Hanging out with all my friends and playing in the games. 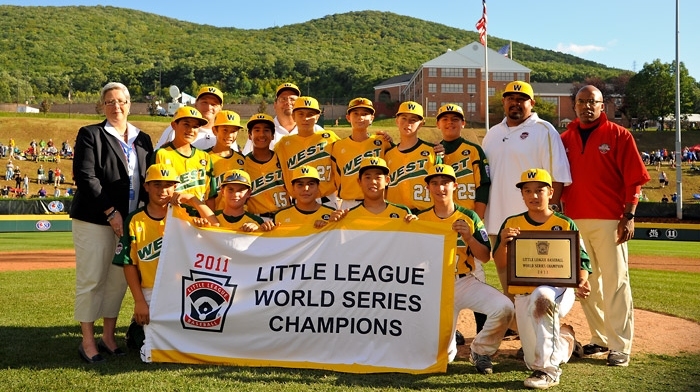 Fondest memory at OVLL: Playing in the Western Regional, and getting to the final game, unfortunately losing to Hawaii. Message to OVLL: Strive to reach your goals and always try to do your best. Goals and Aspirations: To make it to the major leagues. Fondest memory at OVLL: My fondest memory was when I hit my first home run. Message to OVLL: My message to OVLL is to have fun. Message to OVLL: Never give up keep fighting until the end.